"Breathe new life into an old recipe with this sweet and tangy take on an American family classic. This is a tasty and filling way to stretch your groceries while shrinking your grocery bill!" Mix the ground beef, sausage, onion, carrots, onion soup mix, brown sugar, eggs, and barbeque sauce together in a large mixing bowl until thoroughly combined. Stir in enough oats to make the mixture hold together -- you can use up to 2 cups of oats. Divide the mixture in half, and spoon into 2 9x5-inch loaf pans. Place 3 strips of bacon the long way onto each loaf. Bake in the preheated oven until the meatloaf is no longer pink in the middle and the juices run clear, about 1 hour. 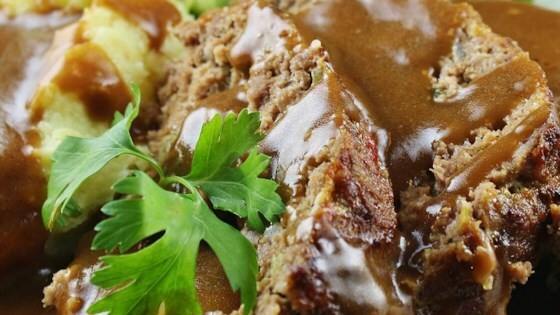 See how to make a super-quick and easy meatloaf. I often remove the bacon when its done and add it to whatever side dish I'm making, such as green beans, creamed corn or cabbage. I forgot to mention that, if you like a glaze on your meatloaf, you can remove the bacon at the 40 min mark and add a BBQ glaze made from BBQ sauce, brown sugar, and vinegar. Best meatloaf ever! I left out carrots and added 1 can of rotel. Everyone loved it! I added diced zucchini to mine.